It’s so easy to get bogged down in the daily grind of business. The 1-Day Profit Blast was a fantastic opportunity to look at our processes and systems with fresh eyes and in a new light. We came home so energized to implement some new things and continue to take our business to new heights! I have more than one take away from each session. Time and money very well spent! I learned an incredible amount and met amazingly helpful and wonderful people. Each speaker gave me a different insight on how to better the business and be successful. The SAF 1-Day Profit Blast really jump started and reinforced my plan to promote our shop on social media. My coworker and I loved all the new ideas, and we are excited to implement them. Profit Blast gave me the opportunity to focus on my business and to learn from the experts in one day at a fraction of the cost to hire them. 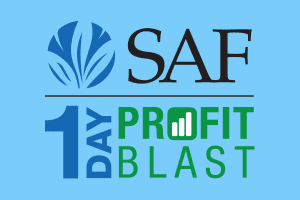 SAF’s 1-Day Profit Blast is very informative and a useful tool in operating a flower shop. Wonderful for busy business owners as your day is jam packed! This was my second one, and I loved it again! I learned so much! The team at Sellwood Flower Co is excited to implement the tips, tricks, and tools we gathered during the conference. We will definitely be going back! Short, sweet, conveniently located and packed with useful information. Thank you SAF and all involved for a great day. I will go every time it’s available in my area. The displays and the fresh ideas were exciting, and it was an opportunity to meet other people who have succeeded in their arena. I’ve attended numerous conferences in various industries, and one of the struggles I constantly face is feeling like I didn’t get my money’s worth. At the end of the day, I want to attend a conference that helps me improve my bottom line. 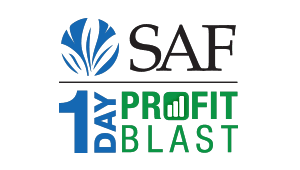 The SAF 1-Day Profit Blast did just that. I walked away with actionable items from each presentation, and I know that I can increase my profit by making a few changes. So worth it for my team and me to attend. I wasn’t sure what this program was going to offer me and my staff, but we learned so much about design, new flowers and products, and we met fellow florists, enjoyed great food and talked to vendors about floral products. I am in a rural area with one employee, and I can apply everything I learned at this Profit Blast to my store. [The information is] not just for the big shops with lots of employees, it applies to all of us. It was an amazing experience. It helped us realize how important in- creasing the delivery fee is. We also took away how important social media is and that consistency is key. We were surrounded by great company with wonderful advice and great food! I came away with great ideas for saving money and promoting our shop. I already love my job, but it renewed the passion and gave me great ideas to help embrace new trends. When an educational event is within even 100 miles of you, mark your calendar and attend. It will be worth the travel time and minimal expenses incurred. You’ll learn something, meet new flower friends and share ideas, and leave ready to take back new tools to improve yourself and your shop. Make the time. You owe it to yourself, your staff and your clients. I gained knowledge about how to better market ourselves through Facebook. I also appreciate knowing how we fall short in selling and [how to improve] our phone presentation as florists. Everyone should attend and learn about all aspects of our ever-changing business in the floral industry. I can’t think of a good reason for any florist not to attend a Profit Blast event in their area. The education is always top- notch, the events are well-run, and the networking is incredibly valuable. Profit Blast is a good place to meet people from the industry, learn what others are doing, and how to become more profitable. Profit Blast was just that, a blast of knowledge and information. It was well Organized, well priced, well located and inspiring. Our employees befitted and would love to attend another one to bring the rest of the crew. Two thumbs up and makes us want to go to the SAF convention. Change is Hard, if it was easy, everyone would do it, get to SAF events, learn, change, grow. You can make money if you get out of your own way. GREAT PRESENTATIONS!! Took home so many ideas from designs to management. Time well spent even though it was a Sunday(my only day off) and the weather was beautiful. Good price also. I was finally able to take advantage of SAF Profit Blast and I’m so glad I did! The presentations were entertaining, fresh and informative. My enthusiasm for my business is back and I can’t wait to get started on growing and growing! I was able to network with other florist in neighboring counties and states, we “Talked Shop” and learned new ways to take orders and suggest pricing, and learned much about my financial situation and how to help it! With a small investment of less than a few hundred dollars….you can realize a thousand dollars in additional profit in just a few months….and every few months after that!!! In this industry there is so many things that are always changing we need to constantly better ourselves to keep up. After over 34 years as a retail florist owner I am still learning!! I never turn away the opportunity to learn something new and meet fellow florists who are sometimes a better source for information than the commentators. I was pleased that my staff heard many of my concepts affirmed by the participants of the seminar. Some would be helped, I’m sure, by learning how to buy and general business concepts. So many seem to turn a relatively simple process into a complicated one. So unnecessary. I so enjoyed spending the day with fellow florist from around the country. Having the opportunity to learn from Jerome and Tim in person was great too. I have followed Jerome and Robin on Facebook since attending the 3 day session in Dallas a couple of years ago. My staff and I regularly watch Floral Strategies webinars and have always enjoyed Tim’s articles in Floral Management. It was great to meet them both in person and learn from them first hand. I recommend that SAF have these in regions throughout the US so others can make it as well. I chose to come to Colorado for work and to celebrate my 50th birthday. It would be nice to be attend an event a little closer to home as well. These events SAF commit to are great learning experiences for everyone in the business and I highly recommend others attend. We took the entire staff and our Delivery Manager asked why? I responded “it is important that everyone is on the same page and everyone is impacted by different presentations”. I hope all florist will seek to raise the bar for our industry and conduct themselves as worthy to be in business with standards to grow this industry. We brought 5 members of our team to the Profit Blast. They all agreed it was worth giving up their Sunday to learn more about the topics provided. I’ve been to several SAF events and always get more ideas than I can implement. 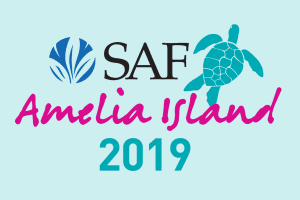 The One-Day Profit Blast gave me the chance to bring key staff members, who typically wouldn’t be able to attend an SAF program.. We were able to listen to well-respected industry advisers and brain-storm on how we, as a team will make our store more profitable. This is a “can’t miss” event. As a new small business to the industry (just one year old) finding hidden profits wss an invaluable segment. I am a dinosaur as far as social media goes, this seminar helped me to understand it much better. I am going to use it much better then I have in the past. The time spent gaining better information, new techniques for sales, and bottom line basics was well worth the registration fee many times over. This was my first time attending SAF’s Profit Blast. I am brand new to the industry and finished with design school just a week before the seminar – talk about perfect timing! While a lot of the information is geared towards retailers with their own store-front shops, I still was able to gain a ton of valuable knowledge, tips, tricks and strategies that I can start implementing into my at-home business right away. Being able to meet several vendors and other professionals in our industry was one of the highlights of this seminar. Each speaker was very engaging with the topics they presented. I feel very blessed to have been at the right place at the right time to be able to attend this amazing event. Wonderful job done by all! The SAF Profit Blast gave me a shot in the arm to give 2016 a fresh start. I feel ready to conquer parts of my business that have been stagnant and under-performing and I came away with the tools to accomplish that. Like so many these days, my schedule stays pretty full, so I always enjoy concentrated learning opportunities. The SAF Profit Blast workshop provided great content well-presented. And what a great chance to see product straight from the farms! Great day. Will sign up again for the next Austin SAF learning opportunity! Continuing education is a must for every in business, and attending these one day seminar’s should be a must for every owner. The One-Day Profit Blast in Austin Texas touched all aspects of running a profitable Retail Florist in the 21st century. Small shop owners must wear many hats to be profitable and stay in business. 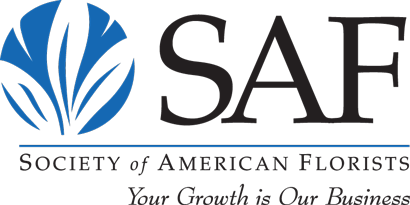 SAF offers the best resources and events to the Floral Industry at a reasonable price. 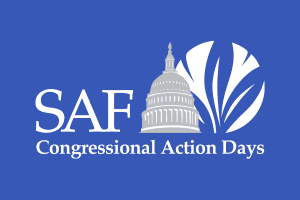 Thanks for the hard work and dedication of the SAF team to continually strive to grow our industry. Most awesome experience for a one day event ever…. top of the line all the way! I found the seminar extremely helpful in keeping my business up to date. To be successful, it’s not just about the design. Running a healthy business fiscally and efficiently should be every shops top priority. The SAF Profit Blast was well worth the time and money spent. Very educational information that I could take back to my shop and implement the next day! Very nice to meet some of the growers that provide our beautiful product and see some of the new varieties they are offering! Had a great time! 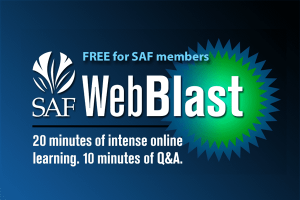 It’s hard to imagine how you could learn more about improving your flower business in less time, for less money – the SAF Profit Blast format is the best possible investment of time and money. Great use of time. The Profit Blast leaves no time for boredom. The schedule includes a well executed hands on live demonstration of design including great descriptions of product names, uses and sources. You are then whisked into business rifling through the bland topic of accounting as it relates to our businesses on a real world simple level that we can all digest, retain and use. From there we become “WE” …as in we are one bunch of retail florists trying to make a good living by having our phone and customer experience etiquette critiqued LIVE as the speaker calls on volunteer shops and we all listen and interact in the discussion of the goods, the bads and the delightful. Finally Marketing in a simple “what I did…what worked and what didn’t” presentation from a seasoned shop owner that we can all learn from. The one day format compresses a lot into a single day and makes the best of our time. Spending a precious Saturday at this event was one of the best choices I’ve made for my business in a while! I was aware that it would be geared toward the retail shop and not me as a wedding and event florist however took the chance knowing I always learn something from other presenters, exhibitors or colleagues and I was beyond pleased and excited with what I walked away with from this event. Attending SAF’s One-Day Profit Blast was one of the most proactive things I have done for my business so far. I learned so many little (but effective) tips that I will be implementing into my own shop from every single speaker. I guarantee I was losing sales by doing/not doing small things that I hadn’t even considered before the Profit Blast. Definitely worth every penny! This is the first time I’ve ever attended an SAF program. I learned a lot from every speaker and was able to take pieces from every speaker back to my studio and implement them in my day-to-day business. We are going to implement many of the items outlined in this profit blast. I can only wait to see the difference these will make in our profits. We already have seen a huge difference in the average sale by implementing Tim Huckabee’s sales training. You might think that accounting is boring but it is very necessary or you will be gone. Derrick makes it interesting and understandable for even the most account-allergic florist. Truly a pivotal moment in my business mentality, because at The 1-Day Profit Blast in Des Moines, IA provided the opportunity to meet and learn about the different aspects of our business. Meeting our growers especially improved my appreciation for our fresh flower product and now I get to share that appreciation with my team. This November 2015 session motivated me to get in the mix with upcoming trends and set a new standard for floral marketing and business strategies in the Midwest. This was an overwhelmingly great day! So many things learned will be put to use immediately in my shop starting today! I’m not afraid of Tim calling my shop anymore!!! Thank you for making this available to the small shops in the Midwest! We learned ways to increase order size just by answering the phone differently. Easy to implement immediately. Learned as much from my table-mates as the presenters. You give a little of your time, and gain a lot of knowledge. I am still trying to digest the wealth of knowledge that was presented to me in such a short amount of time.